Did you hear the joke about the Arab and the Chassid? The Chassid glances quickly at the rotting pile of apples, and rushes off to another fruit stand. Well, it’s not really a joke, but this encounter did cause me to laugh out loud when I witnessed it this week in the market. It just seemed really funny…a religious person should have faith in Hashem. But why in the world would anybody have faith in a dishonest salesperson? Which got me thinking. What’s the difference, really? The difference is that when a dishonest salesperson offers us a box of half-rotten apples, we walk away ASAP. But when Hashem hands us a box of half-rotten apples, we know that there must be something precious hidden within that box of rancid fruit. Hashem wants us to take that box of half-rotten fruit and make something delicious out of it. This week I read about Dr. Baruch Brooks and his wife Roizel who struggled with the hardship of infertility for many years until they were blessed with quintuplets, and ultimately a total of 11 children. But they never forgot their God-given box of rotten apples. And Dr. Brooks used those apples to help thousands of couples struggling with infertility as an embryologist and halachic supervisor at the Shaarei Tsedek Medical Center IVF clinic and as the scientific director of the Zir Chemed Halachic Fertility Center. And then there’s my friend and neighbor Yael Razel, mother of Rivka bat Yael, who nearly died as the result of a traumatic brain injury two years ago, and has since experienced a miraculous recovery (b”H, little Rivki will be starting her studies at a regular 1st grade this fall!). Yael took her box of God-given rotten apples and started a one-woman organization to provide advice to parents whose children have experienced traumatic brain injuries, like her Rivki. And the most striking rotten-apple story of all, I think, is the one I read this week about the Fogel and the Ben Yishai grandparents, the parents of Rabbi Udi and Ruti Fogel z”l, who today travel around the country visiting shiva houses, providing comfort to those whose pain can never be fully understood except by a fellow veteran of unfathomable tragedy and loss. When Hashem hands me a box of rotten apples, I want to just throw down that box and keep on walking, like that Chassid in the market. 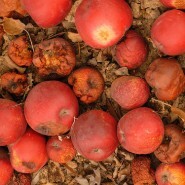 But what Hashem really wants from me is to take my God-given box of rotten apples, and make something good out of it. Apple jam? Cinnamon-spiced apple sauce? Apple pie? Like Dr. Brooks and Yael Razel and the Fogel grandparents. Transforming challenge and tragedy into an opportunity to fix the world and fix ourselves too, IY”H. I love this challenge, to do something with rotten apples. What better way can we show Hashem that we love Him then to take what He offers and transform it. The Torah and today’s best stories are just that, people seeing beyond what appears rotten and restoring the situation for the better. Thank you for this profound essay. So when I read this, I thought, beautiful. But then realized it doesn’t start and end with that. When ur in the situation that’s really tough for u at the moment, it takes a while to get there. Right now I’m having my own little box of rotten apples, which could be so much worse. Bh I had a baby girl five weeks ago and after finally starting to feel myself again, something came up which put me in pain that’s seriously worse then labor. But after all the crying and saying, why me? I’m slowly learning that it’s meant to be and I should be thankful for the beautiful daughter that Hashem gave me.